The ‘Pay Now’ button below can be used to purchase a 1 year single-user professional license for the Flexible Retirement Planner. This license type is limited to use by a single individual during the 1 year license term and is non-transferable. For the complete terms of the Software License Agreement, please visit this link. For information about multi-user and site wide licensing, or if you have other licensing questions, please contact us at info@flexibleRetirementPlanner.com. There are two types of professional use licenses offered, a standard professional license and a custom-branded professional license. Both license types authorize professional use of the planner software for 1 year. 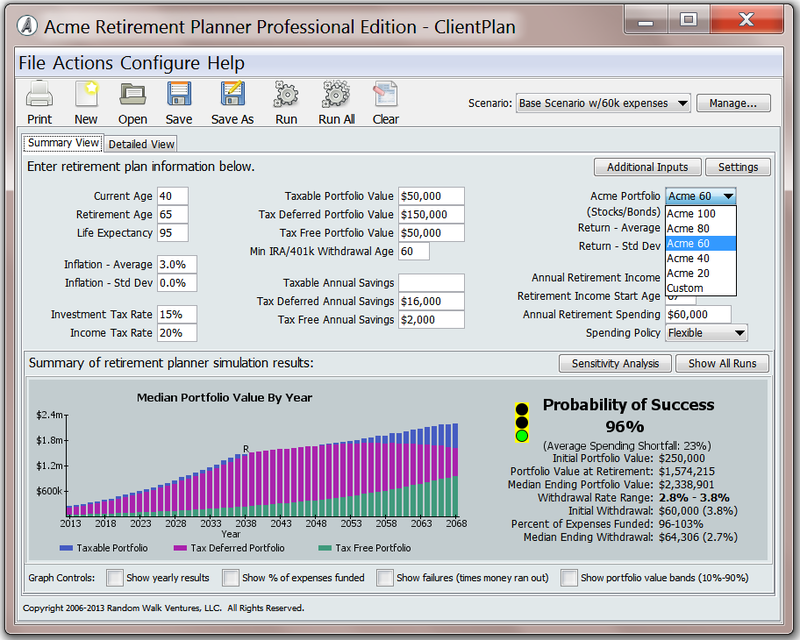 The standard professional license activates the ‘professional use’ version of the standard Flexible Retirement Planner software and removes the commercial use limitations that appear in various program windows and in the program’s printed output. The custom-branded professional license is intended for use with a custom built version of the standalone Flexible Retirement Planner that’s branded for your firm. Each custom-branded professional license is limited to one user and is non-transferable. Please contact us for information about multi-user or site licensing. To use the Flexible Retirement Planner Software, you must agree to all of the terms contained in the Software License Agreement. Please carefully review this document before continuing with your purchase.